(Alameda, CA) Herbert Engineering Corp. has just completed three vessel traffic risk analyses as it expands its engineering services into this important field. HEC provides analysis of risk from changes to vessel traffic associated with new terminal projects or new regulations bringing a combination of analytical skills, emphasizing first principles approaches, together with practical experience in ship design and operations to effectively assess the risks associated with vessel traffic. The recent projects include a potential new container ship terminal for Port Metro Vancouver (PMV), a potential LNG export terminal in Kitimat, BC, and a proposed oil transshipment operation. 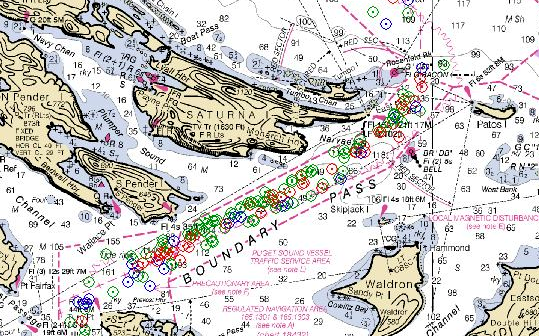 The Roberts Bank Terminal 2 project involved developing frequencies of ship accidents and resulting potential oil spills from accident types including allisions, collisions, groundings, and fire/explosions for first the waters immediately adjacent to the potential terminal, and secondly in the waters extending to the Canadian territorial boundary at the western end of Juan de Fuca Strait in support of PMV’s submission to the Canadian Environmental Assessment Agency. In northern BC, LNG Canada is planning an LNG export terminal to be located in Kitimat at the head of Douglas Channel nearly 160 NM inland from the Pacific Ocean. HEC simulated new vessel traffic patterns and predicted accident and spill frequencies in support of LNG Canada’s TERMPOL submission to Transport Canada. HEC conducted the HAZID workshop together with Worley Parsons Canada and participated in several engagement activities with First Nations along the proposed shipping route. Subsea oil fields can also face special vessel traffic risks. In some cases the severe ocean climate and remote location require transshipment of oil from local shuttle tankers to long distance transport tankers. HEC assisted the oil majorin assessing overall oil transportation risk and in the comparison of two potential oil transshipment locations. HEC conducted a HAZID workshop and various traffic and grounding simulation studies using staff from its Alameda and Glasgow (HEE) branches. For more information on HEC’s capabilities in this area contact Colin Moore at: cmoore@herbert.com.